Let’s face it, island living is not easy to sustain. And by that we mean the ability to stay away from human interaction can only be sanely carried on for so long. A few hours in a day to a few days in a week are perfectly normal to rejuvenate and connect with ones’ deeper thoughts – which in most cases generally tend to be about what to eat in the next meal. But if we were asked to remain so for extended periods of time then we may certainly start developing certain certifiable personality traits. So one thing is confirmed – human interactions are necessary for us to survive. Now what about human interactions at work? Well, you may still get away with going to work, slouching in front of a computer all day long and then heading back home as the clock strikes 5. Or as in some cases, when the clock strikes it’s time for burglars and owls to head to bed. If you are an employee whose job requires minimal conversations, you can in principle, not share phone numbers, lunches, courteous Hi’s, elevator-mindless-nothings or even glances with another. However you possibly cannot get away without interactions if you happen to be managing a team of staffers. And so we come to the topic of this article – the managerial skill of the peoples. 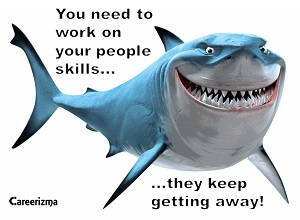 What kind of people skills should a manager possess? This article is to explore the main ways you can effectively be a better, scratch that, super manager in your organization. Until now, many studies have shown the importance of qualities such as communications, team-building, motivation, coaching, rewarding and a general goodwill humane attitude that has affected any organizational health, meaning its staff. Refer to Drucker 1999, Hebda et al 2007, LaFasto & Larson 2001, Giley McMillan Giley 2009 and more. Here, we will summarize the main qualities that can make you the effective instrument of progress, through management. It is an art to be articulate. Good communication is not not so much about being able to speak with the least number of grammatical errors. Not in the least. As a manager, you need to possess the skill of conveying your thoughts with clarity, either when you are speaking to or for your team members. The idea is to be transparent about what is expected of each employee. As long as expectations are laid down, the process of achieving the goals become unambiguous. Read more on how to develop your communication skills. And for the same it is essential that you know each member well and follow their efforts, perhaps even coach (Read Managerial Coaching Skills) them if required. The line of communication and consequent acknowledgements make for good motivating factors. That brings us to the next important manager goodness – the ability to motivate your team. A team is not a perpetual unstoppable machine. There could be times when the work load is too high, the work itself is too tough and stressful, or perhaps there are difference of opinions that are holding a team back from realizing their results. Sometimes even individual members may go through crisis of confidence, thereby constraining their professional development. A motivating manager acts like a cheerleader, helping the team through tough times, minus the pom-poms and the spandex! When times get tough, it is upon the manager to make solid decisions to help ease the pain. A manager who cracks under pressure is probably of little to no help. Your team is not one-dimensional. There may be members with personalities unlike your natural frequency. While you may shed snide jabs at that cheeky guy who cut you off on the drive to work, a more cautious and sensitive attitude is expected of you at work. It doesn’t mean handling your staff with kid gloves, but rather treating them with tact and respect. It is a two way street. Remember, history is full of revolutions! This sword slices both ways. If you trust your team, you cease to be a pain in their rears. At the same time you get to sleep better by being able to let go of the neurotic controlling micromanaging nature which is causing you to spend thousands in under-eye dark circle treatment! Trust also manifests in other ways, such as delegating more responsibilities to your staff, in turn increasing their confidence. It is human nature to squabble. Even twins do. So there is probably nothing magical about your team, stopping them from gnawing each other’s eye out, if confronted with a difference of opinion. It could also be a less violent cold war like environment, making for chilling meetings, full of tension. This, you cannot just ignore and hope will settle down in a few days, if it has begun affecting the over all mood of merry workers on the office floor. Tact and fairness are given qualities in any leader. Ask Solomon, who was ready to saw a baby in half to prove a point! Instead of letting conflicts grow and take over daily goings, mediate. Bring the parties in for a peaceful discussion and let each spill out their emotions while you take notes, much like a couple’s counselor! And if conflicts seem to be going out of control, axe the printer in half – first, it helps to release the stress and second, it’s no ones’ baby! This one is easy to do and a great way to get the members closer to each other. Get out of the building to involve your team in some social activity, as a group. Volunteer at a charity, go out for drinks, camp at Corbett or maybe even hike to the top of the Mall floors, where the movies are. Getting out in a social setting and interacting casually makes people realize that there is life beyond the cubes and that their colleagues, and manager, share that life too! Be approachable. It will help them be transparent to you when you care enough to listen. Communicate to your team early on that you are open to one on one chats, not necessarily about work alone. That way you can guide them with technical, career and even interpersonal development plans. Even if you don’t happen to have the right answers, this easy exercise can increase their confidence. And the plus for you, as a manager, is the reflection of your encouragement in the kind of work they produce. Respect their personal and professional life balance. It helps to retain the good ones. A general flexibility of letting employees decide their respective developmental plans, makes them feel independent and personally invested in their jobs. Do what you preach. If you want your team to be efficient, creative, honest, punctual and the other few good things, make sure you are those too. No one wants to follow a leader who doesn’t believe in his own convictions! In the end, the art of dealing with people is not something exclusive to managers. Whatever, and more, that have been listed here are applicable to the employees, your boss, your neighbor, your family and even your dog! So try these behavioral means to up the motivation and the general well being of your employees and take on the democratic high road, you know, by the people, of the people and for the people!